What are the best tools for publishers looking to track social media activity at the content level? There are a lot of options for social monitoring, tracking and analytics, with prices ranging from free to very expensive. I thought I’d share some of my favorites that are well suited to editorial content sites. The primary focus here is on social media analytics and share count tracking, along with identifying content and topics with the potential to go viral. I have intentionally left off most of the wider-ranging management platforms and enterprise suites to try to limit the scope. These real-time analytics platforms are among the most popular with news and content sites. Having one is worth the investment. Chartbeat Publishing was the first on the scene in this category and it continues to be the most popular. The functionality is broader than just social media but you can drill down on social referrers and activity. Check out their live demo. SimpleReach is a newer option that is well respected and making good gains. It has a greater degree of social-specific reporting. Parse.ly is another popular choice that has strong momentum. It also has a broader focus but the social data you need is covered. Spike from NewsWhip is well-suited to news sites with good functionality for both journalists and marketers. HipDek is an up-and-comer; it hasn’t achieved the critical mass of the others yet but it offers good functionality specific to publishers. Nuvi offers some useful real-time dashboards and reporting options. I don’t have first-hand experience with this one but the functionality looks good. These tools are useful for pulling social data on your own site as well as the competition. I really like BuzzSumo; it has become my go-to resource for quick analysis of a specific site or topic. Currently the full functionality is free; there is also a Pro version in the works. Social Crawlytics allows you to crawl a domain to drill down on social metrics by URL and author. It’s a good way to get some basic competitive insight. Rival IQ is becoming popular for competitive analysis in social and other marketing channels. Shareablee provides social engagement data and competitive benchmarking for a variety of platforms including Facebook, Twitter, Google+, Instagram, Tumblr and Vine. As mentioned above I’ve left off most of the management tools to keep the size of this list reasonable. But here are a few that are a good fit for publishers. These shouldn’t be your only source of social analytics but they each provide useful data. HootSuite is popular with editorial teams because it offers good all-in-one functionality without being overly complicated. Sprout Social is another popular choice that has strong features. Engagor is a comprehensive all-in-one tool with a good analytics component. Buffer has evolved from a nice choice for custom scheduling to a more comprehensive option. Buffer for Business is good for larger teams. Here are some other recommended options for social analytics and tracking. Most are not specifically tailored to publishers but they have good functionality. Known for its clean reports with strong visuals, Simply Measured is a good option for overall social analytics. If budget is tight their free tools are nice too. Moz Analytics continues to incorporate more social data into its reporting, so this has become a worthwhile choice. Trackur made its name as an affordable alternative to the larger social media monitoring tools. Monitoring is its primary function but the analytics component is good too. Curalate is a great option for image-focused content on Pinterest, Instagram and now Tumblr. Bottlenose is nice too. The primary focus is on trend analysis but it has a wide range of useful functionality. 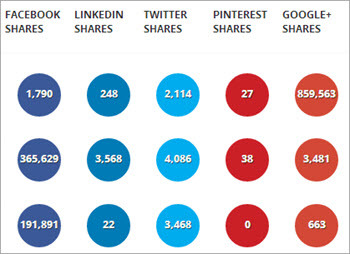 Some basic free tools that provide the social share counts for a specific URL. SharedCount is very basic, but it works and it’s free. Share Tally offers more visual reporting and it provides the option to click through to see the specific shares on some sites. AudienceWise has a couple of handy tools that are free. The Social Shares by URL tool lets you pull the stats on up to 20 URLs at a time. The Social Shares by Sitemap tool lets you submit a Google News sitemap to get the tally for every article in it. Topsy doesn’t exactly fit in this category since it’s largely focused on Twitter and has wider functionality. But it’s a nice option for checking the tweet count for a given URL, and more usefully who tweeted it and how influential they are. There are a lot of great tools out there and it is easy to miss some. What else are you using that I didn’t cover? Let me know and I’ll add any that are well matched to news and content sites. Great list Adam – thanks, bookmarked! It could fall under multiple categories, but I’d definitely add Bottlenose (http://bottlenose.com/) to your list. Glad you liked it Aaron. Bottlenose is a good one; thanks. I’ve just added it. Hi Adam! It’s always interesting for me to read articles such as this to gauge what people are saying about social media management tools. I notice Engagor isn’t in your list, and if you haven’t already heard of it I invite you to check us out! Engagor is a SMM tool that covers all the bases including monitoring, deep insights, and customer engagement. I’d be interested to hear what you think! Thanks for recommending Trackur in your list! This is a fantastic list. I am an author, not a publisher, but can see these tools as being very helpful. Thanks Cameron, I’ll check out Engagor. And thanks G.G., I’m glad you found it useful. Appreciate the Simply Measured shoutout here! This is a solid list, keep up the good work. Great list Adam! I’d also throw Shareablee into the mix for both your own brand analytics and a competitive deep dive! Thanks Lisa, I added Shareablee to the list. And Cameron I added Engagor too. Don’t forget Spike from Newswhip! Spike is a good one that I forgot about, thanks Conor. I’ve added it to the list. Thanks for the post. I wish you post more often and hope things are well from your end! You should really check out NUVI and then redo your rankings. A joint acquaintance of ours tipped me off to your list. Please consider checking out B2B Content Engine (www.b2bcontentengine.com): we are a social content marketing tool that encompasses all the necessary ingredients to achieve meaningful business results through social media: your content, curated content, calls-to-action, and analytics. Steve – NUVI looks interesting; I’ve added it to the real-time analytics section. Also to clarify the tools in this post are not ranked. Andy – Thanks for sharing B2B Content Engine. It looks like an excellent option for start-ups and small businesses. I’m not sure it’s an ideal fit for large-scale news and editorial content sites however. But I’m happy to suggest to relevant businesses when appropriate.